Komen Puget Sound began in 1993 through a small group of local volunteers who joined together with a vision to end breast cancer. Led by the late CJ Taylor, their first order of business was to organize the Puget Sound region’s first Race for the Cure, which remains the organization’s premier fundraiser and is held at Seattle Center the first weekend each June. 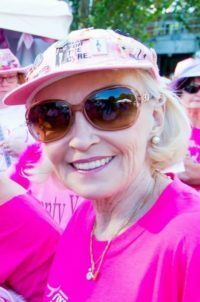 Among the founders was Jan Slawson, a breast cancer survivor and longtime Komen volunteer who also served on the new affiliate’s first board and later, Komen’s national advisory board. Jan recalls meeting with the small but determined group of women, along with a Komen affiliate representative who’d come up from Oregon. After that first Race, Komen Puget Sound was able to award its very first community grants to the tune of $42,000. Since then, the affiliate has funded more than $30 million in breast cancer screenings, patient support and medical research. Examples of recent grantees are Cancer Lifeline, providing financial assistance and support for low-income patients who are in treatment for breast cancer; and International Community Health Services, offering breast health education and screening to low-income and limited English-speaking Chinese, Filipina, Korean, Mien, Samoan and other Pacific Islander, Asian Indian and Vietnamese women in Seattle/King County. In pursuit of its bold goal to reduce the number of breast cancer deaths by 50 percent in the next decade, Komen also funds breast cancer research at institutions that include Fred Hutchinson Cancer Research Center and the University of Washington. These grants currently emphasize expanding our knowledge of metastatic (stage IV) breast cancer and how to stop it; improving treatments for aggressive forms of breast cancer, detecting primary and recurrent breast cancer at an early stage, and testing ways to target breast cancer disparities and overcome barriers to care. In support of those who live with metastatic breast cancer, Komen partners on the annual Northwest Metastatic Breast Cancer Conference, set for October 26-27 in 2018. The annual event brings patients and their caregivers together with researchers and healthcare providers for most current information on treatments, research trials and national issues/advocacy. The 25th anniversary Race for the Cure is set for Sunday, June 3 at Seattle Center; it’s shaping up to be a big celebration and reunion with Jan and other longtime luminaries of the event leading the Survivor Parade (reimagined for 2018 as the More Than Pink March). To sign up to participate and fundraise for Komen Puget Sound through Race, or to volunteer, visit www.komenpugetsound.org/race or follow the affiliate on Facebook , Twitter or Instagram.